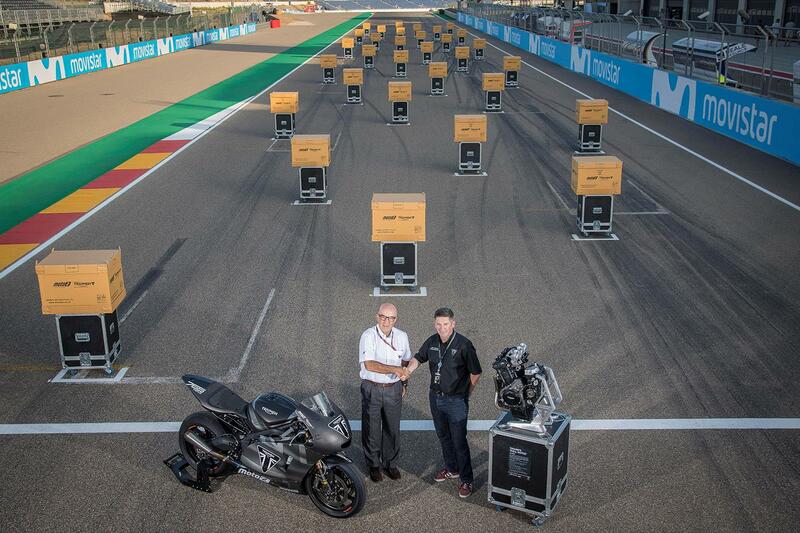 Triumph have completed their official handover of the first engines that will power the 2019 Moto2 grid, presenting them to the one-engine-series’ technical partner at their base at Motorland Aragon ahead of this weekend’s Aragon Grand Prix. The official handover marks the end of the full engine development and the beginning of the new era of Triumph Moto2 765cc powered motorcycles - which will be seen in action on track for the first time at the Moto2 test at Jerez from 23rd- 25th of November. Speaking at the handover, Steve Sargent, Triumph’s Chief Product Officer, says that he’s delighted with the development progress they’ve made. “We are incredibly pleased with the outcome, and with the passion and dedication of everyone involved. We are hugely grateful to Carmelo Ezpeleta and the entire team at Dorna and of course the teams and riders for the opportunity for Triumph to return to the top flight of racing. The excitement and positive response we have already seen from our customers, the army of Triumph fans worldwide and in the Moto2 paddock has shown us already how powerful this partnership will be for Triumph.